At Children’s Choice we like to help spark curiosity in kids to learn about things they’ve never known before. 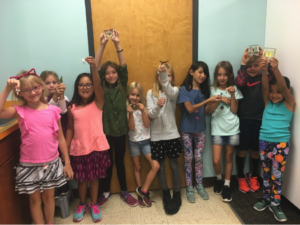 In September, Erik ran a Metamorphosis Club with the children so they could learn more about how certain animals change from one state to another. The first animal we learned about was the butterfly, Monarch butterflies in particular. We started the club by hearing a story from Erik about how his family helps to raise Monarch butterflies in New York. It all starts by going into the field and finding milkweed, a common plant in New York. Then you find the tiny monarch eggs and small caterpillars and transfer them to a vented tank where they can grow safely in captivity. You have to go cut milkweed for the Monarch caterpillars to eat since this is their only natural food source. As they grow in size, eventually it is time for their transformation and they climb to the screen on top of the tank and hang in a J shape. They hang for hours and then suddenly shed their skin, revealing a chrysalis beneath. After a few weeks, the chrysalis cracks and the Monarch butterfly emerges. At first the butterfly looks crinkly; it’s wings are wrinkled and its abdomen is swollen. The butterfly pumps blood from it’s abdomen into it’s wings to inflate them and eventually be able to fly away and begin the cycle all over again. 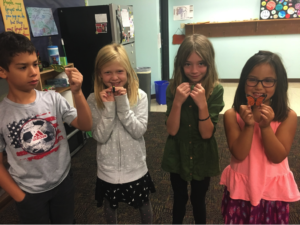 We examined small plastic figurines of the four stages of the Monarch caterpillar’s life cycle, starting with eggs, caterpillars, chrysalis and then butterfly. Then we looked at pictures from Erik’s trip to New York and saw how the butterflies were raised. 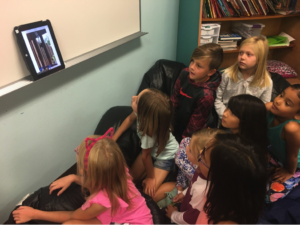 We watched a video of the transformation from hanging J caterpillar to chrysalis and another video of a Monarch hatching. 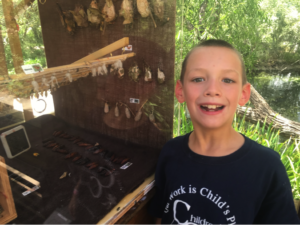 Erik was able to bring several empty chrysalises back from New York so each child got to have a hands-on examination of a chrysalis. They even got to take home their own to keep! 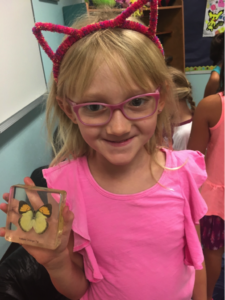 We also studied several acrylic specimens on different butterflies from around the world and looked at the different wing patterns. We had a discussion about the importance of not touching real butterflies on their wings. Erik: What more do you want to learn about butterflies? Eva: Why do butterflies die when people touch them? Erik asked the group: Why is that? Lada: When people touch them we have oil on our hands and that hurts their wings. Then if a predator comes they can’t fly away and they get eaten. Later that day we took a field trip to the newly renovated Butterfly Pavilion at the ABQ Biopark. There we met butterfly specialists who showed us different things about butterflies. 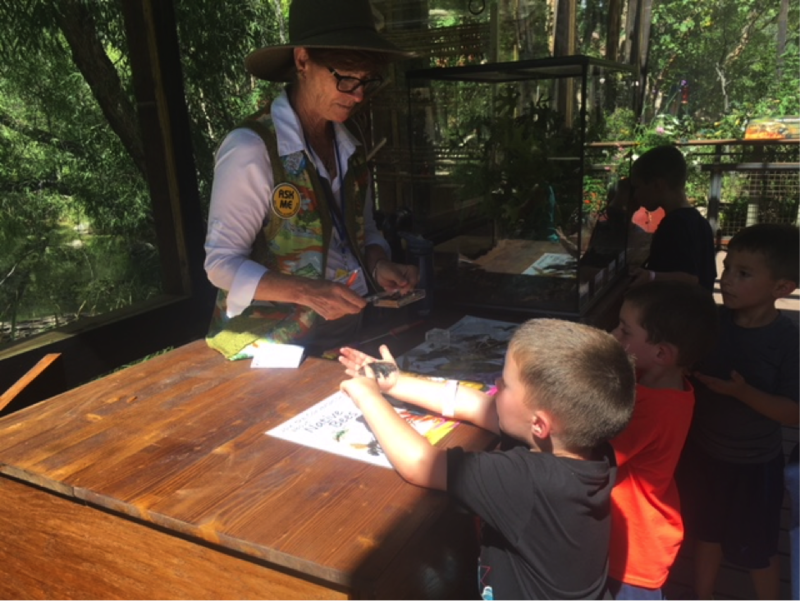 The children were able to handle butterfly wing specimens and learn about the importance of butterflies as pollinators in the wild. 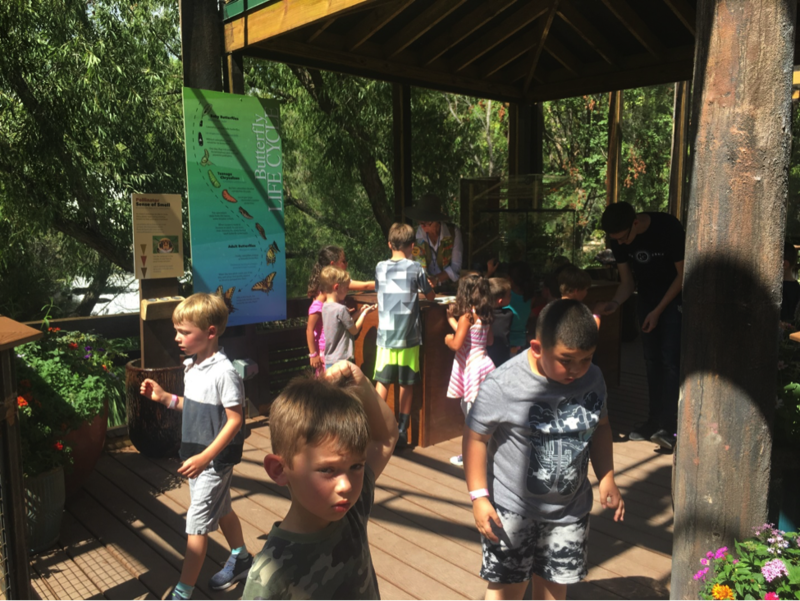 The kids really liked looking at all the different types of local butterflies that were on display at the Butterfly Pavilion. Several different species of chrysalises were on display and we were able to match some of the chrysalises to the butterflies that had already hatched and were flying around the space. 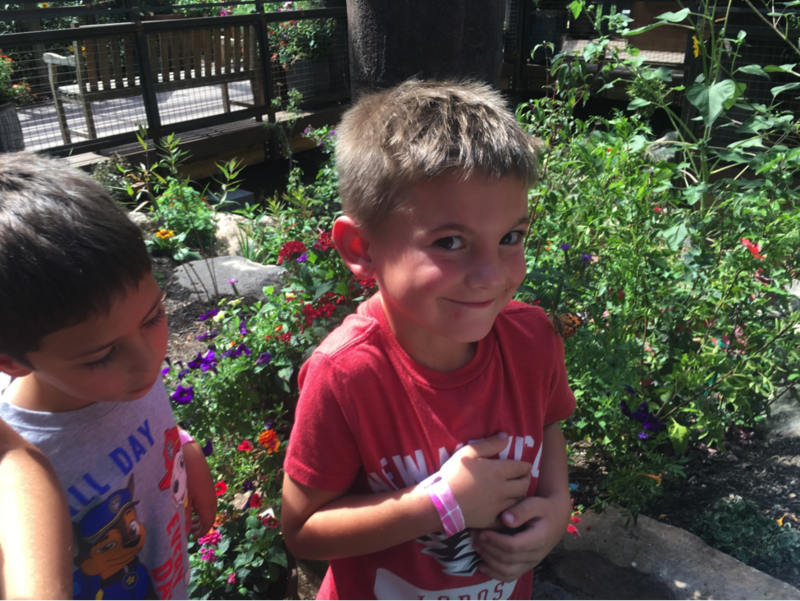 Erik interviewed some of the children to see what their favorite part of the butterfly experience was. Eva (above) is waiting patiently for the butterfly to fly onto her finger. Erik: What did you like about looking at the butterflies? Erik: What was cool about the way they looked? Eva: Their wings. They had different patterns on their backs. Erik: If you had butterfly wings what would they look like? 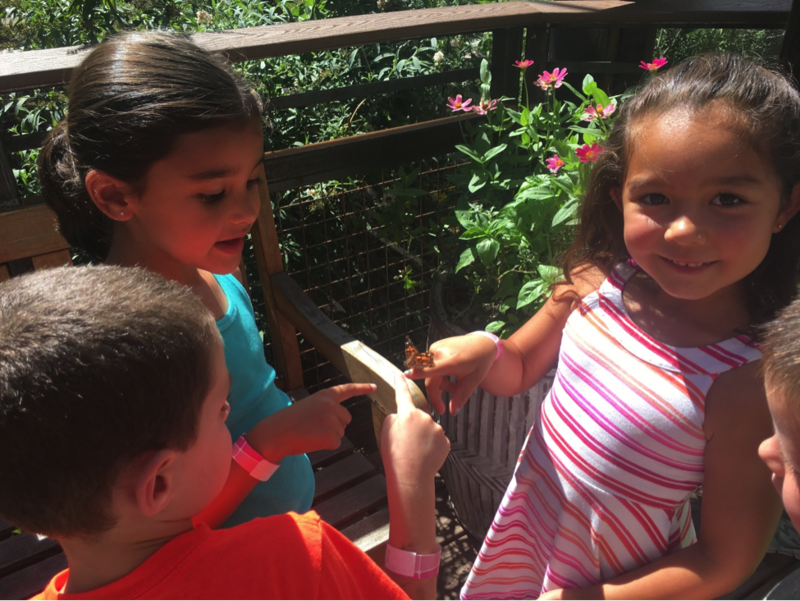 The kids learned about how to be gentle and kind to the butterflies and some of them had butterflies land directly on them! We were careful to never touch their wings and to watch where we were stepping as we walked around. Erik: What was the most interesting thing about the butterflies? Jay (above in grey): The way they moved and reacted to things. Erik: How did they react? Jay: If people went close to them they flew away. Erik: Why do you think they would do that? Jay: Probably because they were scared. Elliot: Yeah, we’re huge giants to them! 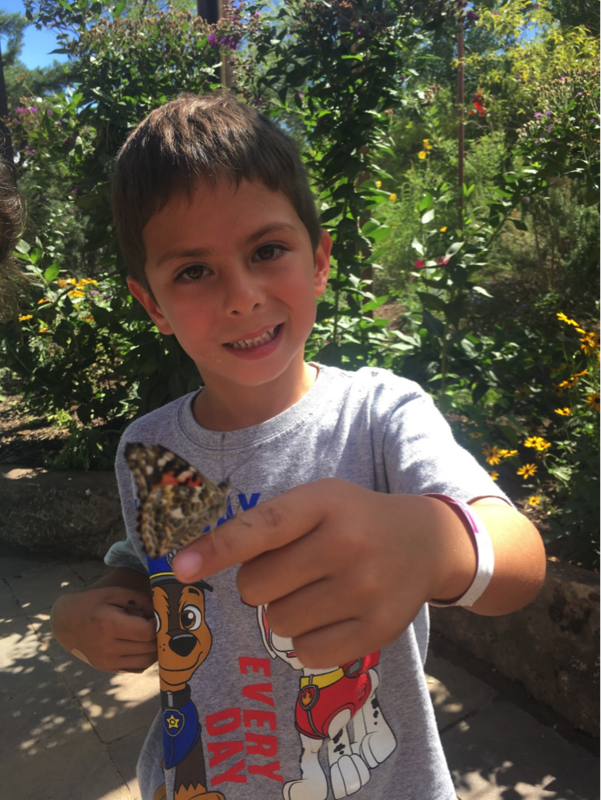 When we arrived back at the school, Erik asked the children about what they thought about butterflies now and to see what they had learned from the experience. Erik: What do you think was the coolest thing about the butterflies? Alyssa: I liked looking at the butterflies because they had pretty wings. Elliot: It was cool the way the caterpillars turned into butterflies. Erik: What’s so cool about that? Elliot: It’s crazy that they can survive that. They have to be in their cocoon a really long time, how do they survive without food and water? Overall this was a fantastic experience for the kids. 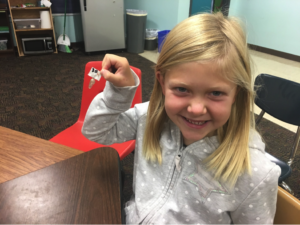 We were able to take the curriculum we were learning at the school and go into the world and get a hands-on learning experience about butterflies. 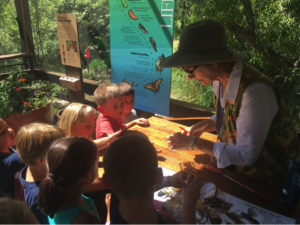 The children’s favorite parts were having butterflies land on them and learning about how the butterflies pump blood out of their abdomens to inflate their wings.